I need to admit, Savio Soares surprised me again with this wine. We tried it at the store Saturday night, just to refresh our memory and .... WOW! What a wine! The more I discover (or rediscover) his portfolio, the more I love his wines. Savio has, in my opinion, one of the best portfolio of wines from lesser known regions in France, in the New York market (and probably in the USA). I can say that, so far, I probably enjoyed more than 85% of the wines that I tasted and obviously bought from his portfolio, and it is a lot to say for a guy like me. It is rare when I like most the wines that I tasted from a single importer / distributor, but with him, it is pretty much the case every time he introduces me to some of his new wines. Born in Brazil, living in Germany, sourcing his wines in France (and elsewhere) and selling them in the New York market (and more), Savio Soares is a people person. You have to meet him in person to understand the phenomenon. Over the last few years, he really made an impression to most wine buyers he met (like me). He slowly became a reference like Louis/Dressner, Rosenthal, Kermit Lynch, Liz Willette, Wasserman, and a few others. Importing small producers from lesser and unknown regions of France (but also Germany and soon Italy), Savio Soares is entering the very small group of the few dedicated and adventurous importer / distributor that brings some of the most interesting wines in this market. Pleasing, earthy and full of character wines that are mostly organic, biodynamic, or at least from sustainable culture and produced in really small quantities. These wines are balanced, focus with great acidity and excellent structure and texture, and definitely food friendly. Look on the back label for Savio Soares, wine connoisseurs and curious amateurs will be pleased. 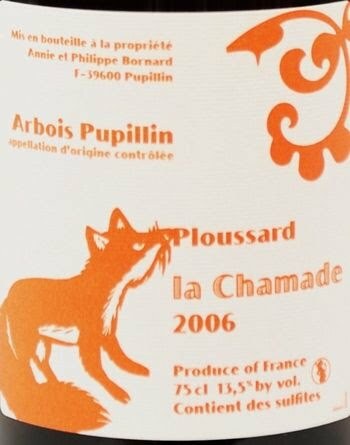 However, let's get back to this extraordinary wine that 2006 Bornard "La Chamade" Ploussard is. Talking about an unknown wine region, Jura is surely one of the less appreciated appellations of France. Located east of Burgundy, Jura is also the name of a small mountain range located in the northern Alpine foothills, in the Franche-Comté region. Bornard "La Chamade" is more particularly coming from the appellation Arbois-Pupillin, where some of the best Jura's wines come from. It is a little wine region within the Jura, which specialities are Vin Jaune (Yellow Wine) and Vin de Paille (Straw wine), two of the most unusual, with oxidized features white wines in France, made with Savagnin grapes. However, a few light yet complex and very expressive reds are also produced there with two grape varieties: Ploussard and Trousseau. Organic by nature, 2006 Bornard "La Chamade" is made with 100% Ploussard grapes. Clean, light and see through, the robe is fascinating, somewhat strange, almost magical, with a wide array of color changing in the glass from slightly orange on the rim evolving into red onion skin, boiled red onion skin, red-brown autumn leaf to almost bright, light red cherry in the center of the glass. Slightly oxidized, the nose is extremely complex, engaging and full of nuances and layers of various aromas and perfumes like nut, nutshell, almond, ripe dark and bright red cherry, forest floor, animal, game, cherry core and smoke with earthy and floral notes. The palate exhibits the same flavors with more intensity, enhanced and balanced by a great acidity that really carries the fruit through the finish. The mid-palate is lovely, rounded and supple yet bright and vivid. The flavors expand nicely toward a long, structured finish reminiscent of a dry, rich sherry wine with more fruit flavors. WOW! What a wine! Somewhat light, but very enjoyable and so easy to drink. It will be perfect for late afternoon, as an aperitif, with nuts, olives, chorizo and dry cheese (and any other things that normally pair with sherry-like wines). As the summer approaches, put it in the fridge to cool it down a little and drink over fish like fresh Tuna or pink Trout, light salads with Feta cheese, or drink it simply on its own to really appreciate all of its nuances. It is really a wine to discover and share with friends, it will surely drag all the attention of the people around. And step into the green! Drink more Bio or Organic wines (and food) from sustainable culture and respect the environment.